In 1982, the superhero partnership of Super-Tough and Young-Tough embarked on their last mission together. The first Nega-Bomb was detonated at a military base by their nemesis, Damien DarkLord. 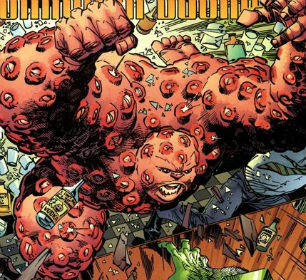 The blast hit one of the men on the base, Peter Davidson, leaving him badly burned by radiation that eventually transformed him into the supervillain known as CessPool. CessPool first made his mark when he was living in the underground of Chicago and he attacked both Barbaric and Ricochet, leading to their working with Dragon. He later formed a team of similarly powered freaks that he dubbed Body Function. They tried to seize power of the Vicious Circle during the Gang War but ended up being folded into the criminal organization instead. After a few years within the Vicious Circle, CessPool was sent after the Dragon who was forced to kill his assailant, stabbing a pole through the villain’s head.